One of the grim realities of life we all have to face is that people die. Good people. People we know. People we are close to. And whether we want to admit it or not, almost all of us have suffered a death that can be considered tragic, unfair, and puts the whole God belief into serious question. I’ve gone through this heavy sort of loss a few times in my life and I will most likely go through it again (heck, it feels like I’m going through it now with a friend and she didn’t even die). Imagine you are a woman who has just witnessed her husband being killed. Imagine he suddenly fell into your lap, blood and brain pieces falling all over you, as you tried in vein to process what was going on. Now, imagine that after this has occurred, you are considering two things: how to tell your children that their dad won’t be coming home and whose going to take over his job. By now most of you probably know who I am talking about because the assassination of John F. Kennedy was one of the most tragic killings in American history. When he was shot and killed the nation didn’t so much as mourn a man who had a serious list of accomplishments under his belt; they mourned the potential that they were never going to get from him. They mourned the fact that someone felt so threatened by his ideas that they decided to take him out to avoid those ideas taking fruition. That’s what the killer was likely thinking when he decided to do what he did. He wasn’t considering the fact that he was shooting a husband next to his wife. He wasn’t going to think about what his wife was going to be doing after the fact. In the midst of the chaos where our government put forth plans to transfer power and deal with the media, they almost forgot the woman sitting in the room with a bloodied coat. For Jackie Kennedy (Natalie Portman) was the woman in the room. She had the difficult task of realizing her husband had been killed. She was trying to figure out how to grieve, how to process the event, all while a frantic world around her has to politely tell her that life needs to move on and she needs to help with the process. It seems logical from a distance, as this is the First Lady and her husband was the President of the United States. When you get up close and personal you realize just how cruel life could be in situations like this. Never mind that this was a tragedy on any level you can imagine, but life didn’t care that Jackie was a wife and mother. It didn’t care who she was. It dealt her a tough blow and she had to roll with the many punches that were to come her way. She even has to debate whether or not it was “proper” to bury her husband in the family cemetery or lay him to rest somewhere more public. “Jackie” is a unique specimen of a movie in that it revolves around the title character, yes, but it isn’t really about her. It’s not so much about her life or who she was as a person. It is about an event told from an alternate perspective. Everything that is tackled in this movie is done so because her husband died. It takes a popular situation and asks a very simple (yet somehow overlooked) question about the whole thing: how did this affect the family left behind? 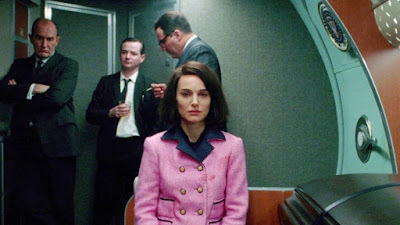 Portman wonderfully captures the spirit of the former First Lady as she portrays a woman who is forced to keep up public appearances during the day with staff members, only to play music from “Camelot” at night, while drinking heavily and walking randomly through the White House as she tries to sort out the personal Hell that has been unleashed on her so unexpectedly. It is fascinating to watch a movie that is about a popular female politician and gives her a lot of depth and emotion, yet still manages to fail the ever more publicized Bechdel Test. 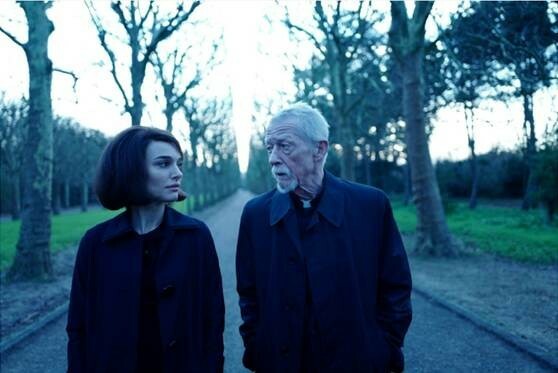 Some will wrongfully call “Jackie” out as a failure because some might see it as a movie that summarizes her entire life by one event: the death of her man. This is not a movie about summarizing a woman’s life though. This is a movie about how a very public person had to deal with a death that was affecting the world in such a profound way. As a matter of fact, I believe she was dealing with her husbands death on two levels, when one is stressful enough. This is the theme the movie is about. I’m not even sure I would called it a biopic even. At times it does have the sort of gratuitousness that a biopic usually has. It features a wonderful performance by Portman who embodies the character, as well as a style of filming that is so authentic to the time period, that the movie is able to blend with news clips of the time almost seamlessly without any problems. That said, it needs to be judged as a movie about how one relates to a specific set of circumstances. It shouldn’t even be considered the defacto story of Jackie Kennedy, as I’m sure a much more thorough movie of her life can (and will) be made somewhere in the future. 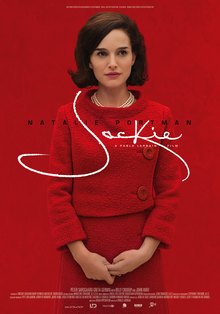 I probably wouldn’t have even called this “Jackie,” as a title like “One Bad Day” would have been more fitting. But Jackie Kennedy is the woman who goes through the trials. We see the tragedy through her unique viewpoint. And she is the one we want to hug and say how sorry we are for her loss. Empathy is what “Jackie” has on its side, and hopefully an ever growing cynical public will realize this. Parents, there is some bloody imagery as well as a couple of f words. Recommended for ages 15 and up.